The Bitterbite of the Healthy Bittergourd! It's not an uncommon sight to see the distorted faces being made as soon as one hears of Bittergourd or karela as we commonly know it. But, as we all might have heard from our mothers and grandmothers, there are innumerable benefits to be have had from having it as well. 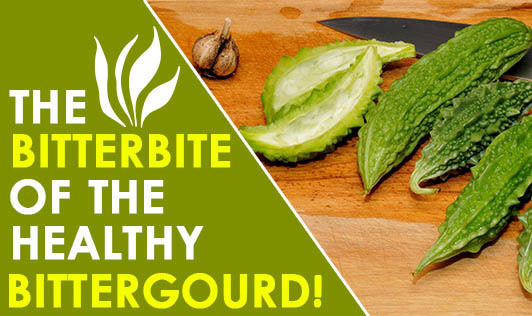 • Blood disorders: Bitter gourd juice is highly beneficial for treating blood disorders like blood boils and itching due to toxemia. Mix 2 ounces of fresh bitter gourd juice with some lime juice. Sip it slowly on an empty stomach daily for between four and six months and see improvement in your condition. • Cholera: In early stages of cholera, take two teaspoonfuls juice of bitter gourd leaves, mix with two teaspoonfuls white onion juice and one teaspoonful lime juice. Sip this concoction daily till you get well. • Diabetes mellitus: Bitter gourd contains a hypoglycemic compound plant insulin) that is highly beneficial in lowering sugar levels in blood and urine. Bitter gourd juice has been shown to significantly improve glucose tolerance without increasing blood insulin levels. • Energy: Regular consumption of bitter gourd juice has been proven to improve energy and stamina level. Even sleeping patterns have been shown to be improved/stabilized. • Eye problems: The high beta-carotene and other properties in bitter gourd makes it one of the finest vegetable-fruit that help alleviate eye problems and improving eyesight. the treatment of a hangover for its alcohol intoxication properties. It also helps cleanse and repair and nourish liver problems due to alcohol consumption. • Immune booster: This bitter juice can also help to build your immune system and increase your body's resistance against infection.